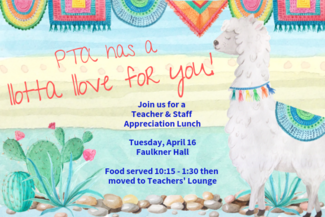 Kiker Elementary PTA’s Teacher and Staff Appreciation Luncheon is on Tuesday, April 16th, 2019, and we need YOUR help! Please help us thank our teachers and staff for all of their hard work by signing up to bring an item. Our theme this Spring is Llota Love! Please drop off all food/drink items to the front desk the morning of the luncheon during student drop off time. Paper goods and gift cards can be brought into the front office earlier in the week. Please refrigerate beverages/cold items ahead of time as we will have limited refrigerator access. We ask that you send all food items in disposable dishes. Please contact Lisa Day ([email protected]), Shannon Venable ([email protected]), or Katy Heisterman ([email protected]) with any questions.